Sindhu was a kingdom mentioned in the epic Mahabharata. It strached along the banks of river Sindhu (Indus) in Pakistan. As per Mahabharata, the king Jayadratha (Duryodhana's brother-in-law) was the king of the Sindhus, the Sauviras and the Sivis. Sauvira and Sivi were two kingdoms that lied close to the Sindhu kingdom. Jayadratha conquered them.The Sindhu and Sauvira were formerly two warring states fighting each other but united by Jayadratha for some period of time. The kingdoms of Sindhu, Sauvira and Sivi were much similar to the Kingdom_of_England, Kingdom_of_Scotland and Kingdom_of_Ireland. They were sometimes united under a common king. Some other times they stayed under separate kings. There was also a fourth kingdom named Abhira (Ophir) which seems to be established by a branch of the Sauvira tribe who established the Sauvira kingdom. This kingdom is similar to the kingdom of Wales. Like England, Scotland, Ireland and Wales, the four kingdoms viz. Sindhu, Sauvira, Sivi and Abhira were sea-faring kingdoms as well as trading kingdoms. They had a flourishing sea-trade and land-trade with other far away kingdoms in Arabia, Africa and Europe as well as with adjacent Ancient Indian kingdoms like Kamboja (to the west of Kashmir) and city-states like Dwaraka (belonging to the Anarta country, Gujarat). The kingdom of Sindhu is especially similar to the kingdom of England. The English language spread across the world and became the language of communication for most of the current world spreading the fame of England to the whole world. The influence of England and English is predominant in the whole world. Similarly, the kingdom of Sindhu is unique among all the kingdoms of Ancient India. The name 'Hindu' is derived from the name Sindhu. Similarly the name 'Hindi' (Hindustani), the name 'Indus' and the name 'India' too are derived from the name 'Sindhu'. The name 'India' later got applied to the whole sub-continent of South-Asia and today it is the official name of the Republic of India (ROI), the largest nation in South-Asia. The name 'Hindi' or 'Hindustani' got applied to the predominant language spoken in India. Besides this, the name 'India' and the name 'Indian' (in the sense, of being related to India, of India, or similar to India) is applied to a wider geographies and far distant ethnicities. Thus we have Indian-Ocean as the name of a vast ocean surrounding India. We have the natives of America named 'American-Indians' or 'Amerindians'. We have countries named as West-Indies and East-Indies or Indonesia. 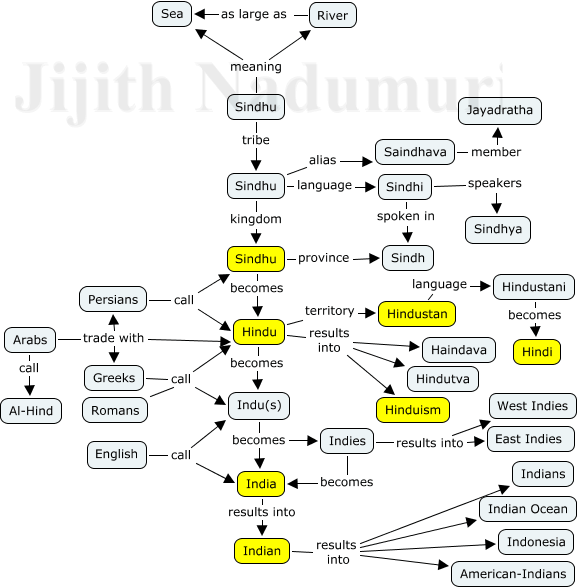 Thus Sindhu and its derivative names like Hindu, Hindustani, Hindi, Indus, India, Indian etc has reached a major portion of the world, much like England and the English language. The name Sindhu in Sanskrit was originally used to denote sea or ocean. It is now currently accepted that the Vedic-Sanskrit speaking ancient Indians who settled in the Sindhu-Saraswati river valleys were indigenous people who lived here for many centuries before creating the Vedas. Before settling on these river valleys, they had experience of migrating along the sea-shores of Africa, Arabia and Iran and hence they were familiar with the sea (Arabian Sea) quite well. The name 'Sindhu' was used first to denote this sea (Arabian Sea) which was much later called the 'Sindhu-Sagara'. When they found a mighty river so wide that it looked like a sea, and settled there, they called it the Sindhu-river (Indus river). Thus the word Sindhu, which originally meant 'sea' started meaning the mighty 'river' which apparently looked as wide as sea. 'Hindu' is the Persian adaptation of the Sanskrit word 'Sindhu'. The 'S' in Sanskrit turns 'H' in Persian. Ancient Persian and Avestan languages were closely related to Vedic-Sanskrit languages. The Sindhu kingdom was one among the trading kingdoms of ancient India, along with the kingdoms like Kamboja ( > Cambyses), Gandhara (Kandahar), Sauvira (Ophir), Sivi (Sibi > Sabaeans > Sheba) and city-states like Dwaraka. They had trade relationships with the ancient Persian kingdoms. The ancient Persian traders pronounced the name 'Sindhu' as 'Hindu'. They called the Sindhus (the people of the kingdom of Sindhu) as the Hindus. The Sindhu tribe (the tribe which inhabited along the Sindhu river) who founded the Sindhu kingdom were thus known as the Hindu tribe. It is wrongly assumed that the name 'Hindu' and the name 'India' was derived from the river Sindhu (Indus). This is not exactly true since it is the people (the Sindhu tribe) and their kingdom (the Sindhu kingdom) that mattered in trade-relationships not a river. The interactions of the Ancient Persian and Ancient Arabian traders were with the kingdom of Sindhu and with its people viz. the Sindhus and not with the Sindhu river. Another wrong assumption is that the name 'Hindu' was given by the traders from Ancient Arabia. However this is not exactly true since the Ancient Arabs got the name Hindu from the Ancient Persians (Iranians). There is also a common misconception that the name 'Hindu' was given by Islamic invaders who conquered India or by the Islamic traders who came to India and traded with sea-faring / trading kingdoms of India (which included the Sindhu kingdom as well). This is also not true since the current form of Islam originated only by around 610 CE. The trade relationships of the Sindhu-Sauviras with the Ancient Persians and with the Ancient Arabs existed much before this time. The Ancient Indians, Ancient Persians and the Ancient Arabs shared a common culture. Cultural Diversity, Polytheism, Celebration of Seasonal Changes & Astronomical Events, Idol Worship etc were some of the cultural traits shared by the Ancient Indians, Ancient Persians and Ancient Arabs alike. From the analysis of Mahabharata, it is clearly evident that the political entities like Dwaraka, Anarta, Sindhu-Sauvira, Sivi, Sura (Sudra)-Abhira and numerous other kingdoms existed during the period of Kurukshetra war, which is dated around 3067 BCE. This war thus took place during the early days of what is now known as the Indus-Valley-Civilization (Sindhu-River-Valley-Civilization:- 3300–1300 BCE). There are several evidences in Mahabharata regarding the trading culture and sea-faring nature of these kingdoms. However, a thorough reading of Mahabharata reveals that these trading kingdoms were not as powerful as the land locked kingdoms like the Madra, Kekaya, Gandhara, Kamboja, Kashmira, Trigarta, Kuru-Panchala and Salwa-Matsya. The center of power was situated in the Kuru-Panchala kingdoms. Dwaraka, Sindhu-Sauvira and Sura-Abhiras were emerging centers of powers. The Kuru-Panchala kingdoms were eventually weakened or perished due to the colossal Kurukshetra war. The sea-faring city-state, viz. Dwaraka was lost to the invading sea in a Tsunami like catastrophe. The remaining sea-trading kingdoms viz. the Sindhu-Sauviras and the Sura-Abhiras gained power and prominence. We can thus safely assume that the peak period of the trade to and from the Sindhu-Sauvira and Sura-Abhira kingdoms through sea and land route occurred after Kurukshetra War, around 2600 BCE coinciding with the peak period of Indus-Valley Civilization (2600–1900 BCE). It is during this peak period that the Ancient Persians and later the Ancient Arabs interacted with the Sindhus through trade via land and sea. It is thus the Persians who first coined the name 'Hindu' to denote their Sindhu trade-partners. This name 'Hindu' later spread to the Ancient Arabs and finally to the Europe as 'Indu'. The Greeks changed the name 'Indu' to 'Indus'. Other Europeans changed the name 'Indu' to 'India'. Finally the names 'Hindu' and 'India' started to mean not just the Sindhu kingdom but the whole of the South Asian sub-continent. From the Mahabharata it is evident that, the Sauviras and the Sindhus fought several wars for dominance much like the Kurus and the Panchalas. During the rule of Jayadratha, the Sindhus had the upper hand and the Sauviras lived under the Sindhu king Jayadratha. Mahabharata also mentions about a Sauvira king who fought against the Sindhus and gained independence from them (See Vidula). It is not clear if this incident happened before or after the reign of Jayadratha. However from the fact that, in the post Kurukshetra war period, the name Sindhu reached far and wide (as Hindu, Indu and as India) we can deduce that the Sindhus were still the dominant power. What was the contribution of Sauviras? While the Sindhus predominantly traded with the Persians and the Arabs, the Sauviras had trade relations with some African nations like Egypt. The language of Egypt was Coptic. "Sofir" was the Coptic name for India!. This was because the Egyptians called their Sauvira trade-partners 'Sophirs' which got simplified into Sofir. Thus there was a high chance that the India were named 'Sofir' rather than 'India'. Sauviras traded with many other ports in Africa. Among them was the port of Sofala, one of the oldest harbors in Southern Africa. It also had traded with Arabia especially with Zafar in Yemen and with gold rich regions now known as Mahd adh Dhahab in Saudi Arabia. The influence of the Abhiras cannot be told apart from that of the Sauviras due to the similarity of their names and due to their close kinship. Usually Sauvira was known to the ancient trading-world as Sophir (or as Sofir) and Abhira was known as Ophir. The kingdom of Sivi was never far behind in having its influence on the ancient trading world. It was known as Sibi (currently a town in Pakistan bears this name). Sivi was a mountainous country and was not well known for sea-trade as per Mahabharata. It is not clear if subsequently they moved to sea-shore or used the trading ports of the Sindhus and Sauviras to perform sea-trade. The Sivis however traded through land for sure. A branch of the Sivis (Sibis) migrated to Arabia and became known as the Sabaeans who established in Yemen, in southern Arabia. Their costumes, life style and culture were similar to that of Ancient Indians. They wore 'Uttariya' (upper garment, wore on the shoulder) and 'Upavastra' (garment worn around waist). They appear in Bible as Sheba or as Saba. The history of king Sivi mentioned in Mahabharata has some similarity with that of king Solomon (Sulaiman). There is a myth of King Sivi protecting a dove from a predator hawk by giving off flesh from his thigh. Same myth is later associated with king Solomon, showing possible cultural interaction with the kingdom of Sivi with that of Solomon. There is a possibility that both the kingdoms were the same. A chain of mountains named Sulaiman mountain lies to the west of the town Sibi.